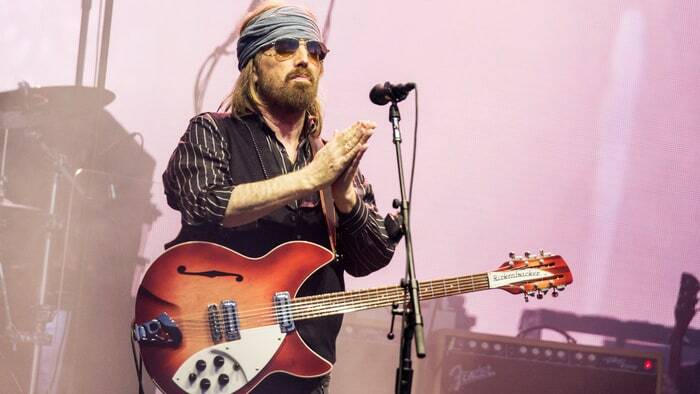 Tom Petty released “Somewhere Under Heaven,” co-written with Mike Campbell for 1994’s Wildflowers but left unheard until now. The track, available for purchase now through digital retailers, which will be part of a new archival project titled Wildflowers: All the Rest. Even a brief listen to “Somewhere Under Heaven” places it firmly in context with the original album’s layered complexity. You can hear a sample of the new song above. The three-times platinum Wildflowers, a No. 8 hit that marked the first of three Petty albums co-produced by Rick Rubin, moved with deceptive grace from brawny rockers (“You Wreck Me,” “Cabin Down Below,” “Honey Bee”) to acoustic fragility (the title track, “Time to Move On”) to moving longform narratives (“It’s Good to be King,” “Crawling Back to You”). And apparently there was much more where that came from. The release of Wildflowers: All the Rest, which features songs written between 1992-94, apparently corrects a wrong that goes back more than two decades. Petty says Wildflowers was originally intended to be a double album. “Somewhere Under Heaven” can also be heard during the closing credits for the movie Entourage, which opens this week. Petty’s last studio album, Hypnotic Eye, became his first-ever U.S. No. 1. It was also his highest-charting U.K. release since Wildflowers went Top 10 20 years ago.. The track was recorded for 1994’s Wildflowers, which will see a second disc from those sessions called Wallflowers: All the Rest hit shelves at some point in the future. But Petty was quick to point out that these aren’t outtakes. While there’s no word on the long-promised expanded edition of Tom Petty’s 1994 album Wildflowers, we have some new insight of the sessions courtesy of its producer, Rick Rubin. In a new interview, he discussed the recording of the tracks and how Petty was “haunted” by its legacy. As Rubin told Malcolm Gladwell on their Broken Record podcast (embedded below), the genesis for Wildflowers came from the sessions that resulted in the bonus tracks for the Heartbreakers‘ 1993 compilation, “Mary Jane’s Last Dance” and the cover of Thunderclap Newman’s “Something in the Air.” After the meticulous work they did with Jeff Lynne, Rubin freed them in the studio, and it resulted in what Rubin called a more “organic” sound, that “felt more alive and more human,” and they decided to continue working together. It was a particularly “fertile” and “prolific” period in Petty’s career, as Rubin noted. Plus, Petty was eager to please his new producer and open to suggestions. “Hope You Never,” one of the leftovers that wound up on the She’s the One soundtrack, was a particular example. Rubin said that they recorded “between 26 and 28 songs,” but Warner Bros. felt a single LP would have greater commercial potential. Petty, who repeatedly fought with his former label MCA, agreed with his new bosses and they went about figuring out which songs to include and in what order. Wildflowers was eventually released in November 1994 with 15 tracks. But Petty always hoped to put out the others. When asked for a song to include in writer-director Edward Burns‘ romantic comedy She’s The One, Tom Petty responded with an entire album. Though nominally a film soundtrack, the Warner Bros. collection stands proudly with the singer-songwriter’s best work of the 1990s. Cut with producer Rick Rubin and the ever-reliable Heartbreakers, Songs and music from “SHE’S THE ONE” has a relaxed feel and eclectic mix of material (including Beck and Lucinda Williams covers) that give the impression Petty was really enjoying himself. Which doesn’t mean his customary craftsmanship is absent; the dozen originals include such terrific songs as “Climb That Hill” and single “Walls (Circus),” which features guest vocals from Lindsey Buckingham. Released in 1996, SHE’S THE ONE is an album sometimes forgotten but well worth rediscovering. The album was not mentioned on the four-hour documentary Runnin’ Down a Dream, though Petty could be seen doing a studio session of the song “Angel Dream (No. 4)”. Some songs were originally recorded for Wildflowers and were put on this album to fill it out. When In April 2015, when Tom Petty’s back catalog was released in High-resolution audio, this was one of only two albums not included in the series (the other being Wildflowers). There are two songs on the disc that Petty chose to record and release in two different versions. The first is Walls which kicks off the album with its Beatles- and Byrds-inspired psychedelic version, aptly titled Walls (Circus). The version appearing later in the disc is more barren and Dylan-esque in nature. The second song to appear twice is Angel Dream. Both versions borrow a page from the Simon and Garfunkel book. The first to appear is more like the Bridge over Troubled Water era, while the later version borrows from the Wednesday Morning, 3 A.M. era. One of my favorites on this disc is Hung Up and Overdue which borrows heavily from The Beach Boys’ Pet Sounds album. Most notable on this disc is Petty’s merging into a pattern similar to Neil Young’s. His Heartbreakers are like Young’s Crazy Horse, and his sound blends from solitary acoustic music to all-out feedback-laden rockers. It certainly keeps things fresh with the stark contrast between the styles and seems to fit Petty as well as it fits Young. American Treasure, is a 60-track box set featuring previously unreleased live and studio material from Tom Petty, will be released on September. 28th. The songs on the collection are reportedly drawn from all phases of Petty’s career with his longtime band the Heartbreakers. Full details including a complete track list are expected to be announced soon. The news was revealed today on Petty’s SiriusXM radio station, along with the debut of the first track from the box set, 1982’s previously unreleased “Keep a Little Soul.” American Treasure was reportedly compiled by Petty’s daughter Adria, his wife Dana, Heartbreakers guitarist and keyboardist Mike Campbell and Benmont Tench and “studio collaborator” Ryan Ulate. After the countdown clock emerged this morning, many fans speculated that the news would be concerning the release of a double album version of Petty’s 1994 record Wildflowers. He had originally intended for the album, his second solo effort, to be a double album, but, at Warner Bros. request, he scaled it back to a single disc. In 2014, it was reported that a set expected to be called Wildflowers: All the Rest, that restored the complete track list, was in the works to coincide with the album’s 20th anniversary. Only the song “Somewhere Under Heaven” has officially surfaced, appearing during the closing credits of the Entourage movie. “That would have been smaller-scale, away from the hits,” guitarist Mike Campbell later added. But he said that the plan, to which Norah Jones had signed on, was scrapped in favor of a career-spanning trek to celebrate the 40th anniversary of the Heartbreakers. Unfortunately, Petty died a week after the last date of the tour, a September. 25th show at the Hollywood Bowl. An American Treasurewill contain previously unreleased studio recordings, live recordings, deep cuts and alternate versions of popular Petty songs,. The collection will encompass 60 tracks in total. A less expensive two-CD set will also be available for purchase. Petty was found unconscious at his home in Malibu on October 2nd, 2017. He was taken to the hospital and put temporarily on life support. He died hours later. After we lost the iconic rocker Tom Petty. The 66-year-old died of cardiac arrest. In his memory, a new tribute collection called “An American Treasure” features previously unheard recording and live performances. Anthony Mason spoke to Petty’s daughter, Adria, in her first TV interview since her father’s death. An outpouring of grief swept the music industry at the passing of Tom Petty , as it was confirmed that Tom Petty died from a cardiac arrest at the age of 66. Father John Misty offered up probably the most poignant and thoughtful tribute to Tom Petty with a soulful rendition of his “To Find a Friend” from the iconic Wildflowers record. Performing at the Orpheum Theatre in Phoenix, AZ, Josh Tillman took some time to pay homage to the late singer-songwriter with a solo acoustic version of the song. Tributes to departed American icon Tom Petty have been pouring in since his death on Monday. Jeff Tweedy and company’s faithful rendition of the Hard Promises hit became a cathartic sing-along at the Music Factory. The world was still reeling from Petty’s death Monday following cardiac arrest at the age of 66. On Monday, Wilco also posted this video of them playing Petty’s “Listen to Her Heart” way back in 1995. I tend to be pretty quiet about celebrity deaths… but I’ve got some words about this one. I was raised on Tom Petty. Trapped in the car on long family road trips, his music made me feel colors. His songs felt like peepholes into a great wild world I knew I would one day be exploring myself… and he gave some good pointers. Every time I hear those records, no matter where I am or what’s going on, I feel as though I’m in the company of a dear old friend. More than just being obviously one of the greatest songwriters ever, Petty was a rebel with a cause who took several bold and very public stands for what he believed in, resisting record label executives who wanted to use him as a pawn in their game. If you haven’t seen “Runnin’ Down a Dream,” the epic Heartbreakers documentary directed by Peter Bogdanovich, I highly recommend it! To honor the life and death of this super rad being, on the night of his passing, I recorded a live video of my cover of his song “You Got Lucky.” Best Wishes Johanna Warren. Initially following its release, the album received little attention in the United States. But Following a U/K tour, it climbed up the UK album chart and the single “Anything That’s Rock ‘n’ Roll” became a hit in the UK. After nearly a year and many positive reviews, the album reached the U.S. charts, and eventually went Gold. It’s a great American rock album with beautifully constructed songs and a passionate vocal from Tom Petty. It runs in at a little over 1/2 an hour so it is slightly short by today’s standards but the music there in is wonderful. Before I mention the songs individually , I should say that there isn’t the searing guitar overload of a live performance, in that the solos are short and not as stand-out in the mix. Live, there was more emphasis on soloing but the songs are rock ‘n’ roll works of art and this is an album that you can’t tire of. Luna, is a beautiful ballad, is my favourite song of the album and I would say that it is a unique song , part blues, part lullaby , with a beautiful organ melody that you’ll never forget. The Wild One Forever and Mystery Man are beautiful , gentle songs with melodies to die for. Throw in Fooled Again, Breakdown and Strangered in the Night et.al. and you have one of the best albums ever made. Wonderful stuff !. The singles “Breakdown” and “American Girl” became an FM radio tracks that can still be heard today. The album was recorded and mixed at the Shelter Studio, Hollywood, California. It’s about an hour before Tom Petty and the Heartbreakers play Colorado’s Red Rocks Amphitheatre for what may be the last time. Backstage, Petty is in his dressing room putting on a frontier rebel’s headdress to fight the chill. Keyboardist Benmont Tench is tweeting about the sad state of our country under Donald Trump. Bassist Ron Blair has battled stage fright for years since rejoining the Heartbreakers in 2002, after a 20-year sanity break. He wanders into Tom Petty’s dressing room and cops to something you’re not likely to admit to your bandleader unless you’ve known him for 40 years. “I’m kinda nervous, you know,” says Blair in a quiet voice. The band takes the stage and blows through “Rockin’ Around (With You),” the first song on its self-titled first album, from 1976. Petty ends the next few songs strumming in front of the drum set, trading man-crush smiles with drummer Steve Ferrone (Tench jokes, “They should get a room”). Petty even grins through a joyous version of “Walls,” from 1996’s She’s the One, an album he’s complained about for nearly 20 years. And then there’s a flash of lightning. Rain pours down. The Heartbreakers are shooed into the catacombs of Red Rocks, and 9,000 fans head for cover. Tench, the best keyboardist in American rock, breaks into a pastiche of boogie-woogie, a homage to pianist Pete Johnson. The group chimes in, not quite in sync, until Petty switches to Chuck Berry’s “Carol.” The Heartbreakers fall in line, sounding like the best bar band you don’t want to tell your friends about. They encore with “American Girl.” The bandmates take a bow, wiping sweat and rain off their faces. Everyone exits, but Petty seems reluctant to leave. He takes a few steps toward the front of the stage and gives a last wave. The crowds are still there, something Petty is clearly proud of when we sit down in a hotel room on an off day. To be honest, he looks more jittery offstage than on. This may be because he is chain-smoking, alternating between Marlboros and vaping, perhaps as a concession to the Denver Ritz-Carlton’s smoking policy. Petty says sleep is now his friend. “I need a new Netflix show, does anyone have any suggestions?” he asks just before his assistant ducks out of the room. Someone suggests Bloodline, a noirish series set in his native Florida. What keeps the Heartbreakers together is simple: The band has been their life since 1976. Benjamin Montmorency Tench III, was a prep-school kid and piano prodigy. Tench wears suits and went to Exeter, but he’s the fiery one. In the Peter Bogdanovich documentary on the Heartbreakers, 2007’s Runnin’ Down a Dream, Tench can be heard screaming at his bandmates to take things seriously. His nickname is Mad Dog. When Tench used to go on one of his tirades, a roadie would slide a dog bowl of water under his piano. after adding San Diego native Blair on bass and Stan Lynch on drums. Tom Petty and the Heartbreakers are among the most successful and longest-running American rock band in history, Tench, Campbell and Petty attribute the group’s longevity to two epochal moments: one logistical and one creative. The other game-changer was Dylan. By 1986, the band had toured relentlessly for a decade. Off the road, everyone was a mess – some members dealing with substance issues, some just dealing with real life. “The road and the studio are the only places I’ve ever felt completely OK,” says Petty, lighting another Marlboro. “In any other life situation I’m terribly retarded.” Petty got a call from Dylan asking if the band would back him on a tour. Petty raced out a “hell, yes.” Watching footage, you can see him smiling his head off, ecstatic to not be leading the show. The experience taught him how to be in the Heartbreakers, not just lead them. “That’s when we learned how to really be a band,” says Petty.